Curry scored 28 points and Kevin Durant added 27 points and 12 rebounds but the Warriors missed their final five shots from the floor and their NBA-record post-season winning streak at home ended at 16 games. 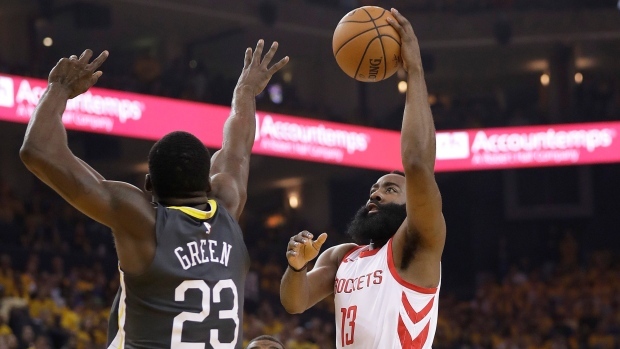 The Rockets shook off a 41-point embarrassment in Game 3, a 12-0 deficit to start Tuesday and another big run by the Warriors in the third, then won it with defence down the stretch. Curry came out and hit a 3 from the top and seemed on his way to another spectacular finish until the late misses on a night both Western Conference powers shot just 39 per cent. Much-improved Warriors big man Kevon Looney, who shed 30 pounds last off-season, earned his first career post-season start in place of injured Andre Iguodala and had four points and six rebounds. Rockets: The Rockets were outrebounded 49-41. ... Houston scored just 19 first-quarter points, its fifth straight period failing to score more than 24 before scoring 34 in the second. ... After saying the pressure was on the Warriors, D'Antoni cracked pregame, "That really worked out well, didn't it?" Warriors: Curry picked up his third foul at the 5:06 mark of the second quarter and took a seat and Golden State was limited to 18 points in the period. He pumped his right arm so hard after a basket in the first he nearly hit official Mike Callahan. ... Curry made his signature pregame tunnel shot on the fourth try. ... Golden State dropped to 32-7 in the post-season since 2015 when holding opponents to fewer than 100 points. ... Looney started for just the ninth time in his three-year NBA career. Iguodala's status for Game 5 was still unclear. Since 2014-15, Golden State is 14-4 in post-season games started by Iguodala. "If it was close, he would play," Kerr said. "He's injured so he's not playing. So we'll see what happens in the next couple of days." The Warriors spoke to the NBA about Green's double-technical in Game 3 with Trevor Ariza issued at the 6:49 mark of the fourth quarter when Ariza shoved Green as they traded words. "They're not rescinding it," Kerr said. "Those conversations are always private, so we respect their decision and move on."